In tonight’s Express & Star, there was an beautifully illuminating report about the cuts proposed for social care provision in Walsall. There are afoot plans to cut spending on services to the vulnerable and disabled totalling ten million pounds over the next three years. Since this article isn’t available online – gnome abuse in Sandwell is apparently more important – I’ve scanned the article below. To read it full size, just click on the image. 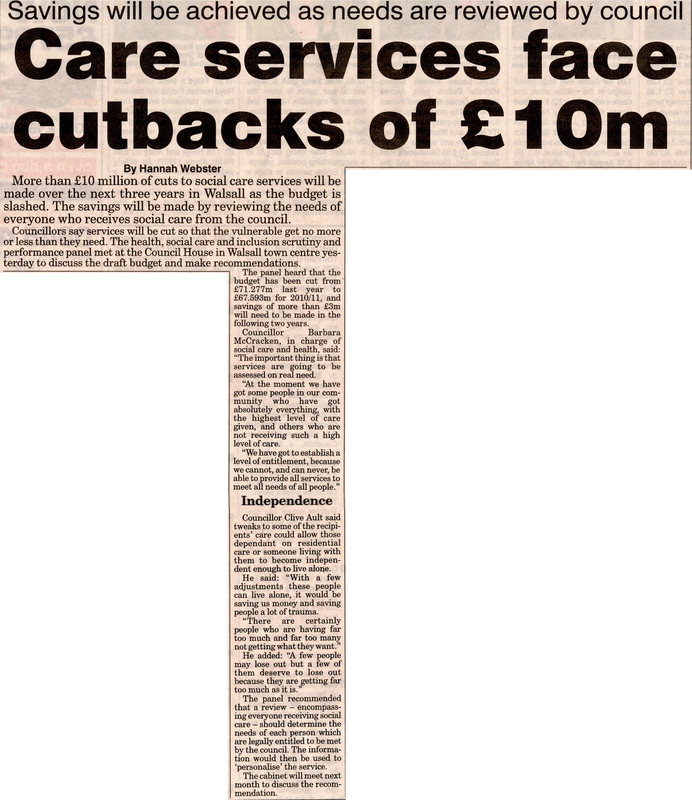 From the Walsall Express & Star, Tuesday 1st December 2009. Click on the article to read it full-size. The ever-vigilant and always incisive Plastic Hippo is concerned about this too. He highlighted in a comment to this blog yesterday, the report going before the scrutiny committee that effectively rubber stamps the dumping of crucial care services onto the voluntary and charitable sector. Lets not be mealy-mouthed about this, Walsall Council are cutting money, equivalent to the combined overspend on the hated, dysfunctional ring road and recent funding cockups, from the budget that provides for the care of the most vulnerable and needy in our borough. In short, those who have no voice and are already poorly served by an overstretched department are being made to pay for the worst institutional failures of the authority. Jarringly, the repeated mantra several times in this article, is ‘Entitlement’. Councillors McCraken and Ault – neither of whom are apparently experts in assessing the needs of service users – repeatedly assert that there are undeserving schmoes out there living the life of Riley on benevolent old Walsall Council while others – mysteriously – don’t have it quite so good. I find those statements patronising, frightening and portentous by turns. They are actually saying that some of their clients deserve to lose support – that’s a very strong, telling statement. What has apparently been going so very wrong with provision that that has occurred? Either the Social Care department are incompetent, or the cabinet is. I know which my money is on. The unedifying spectacle of elected councillors attacking their service users in this manner is breathtaking. In the meantime, do try not to get ill. It’s causing terrible problems in the civic centre, and you’d just hate them having to judge your worth. This entry was posted in Express & Star, Followups, It makes me mad!, Local media, Local politics, Shared media, Walsall Council and tagged Barbara McCraken, Budget cuts, Clive Ault, Express & Star, Local politics, Politics, Social Care, Social Scrutiny, Social Services, Walsall, Walsall Cabinet, Walsall Council, Walsall politics. Bookmark the permalink. It’s good to see some younger people campaigning on this issue. Walsall Councill have a duty of care for their older people so it might be worth investigating if they are in fact breaking the law.